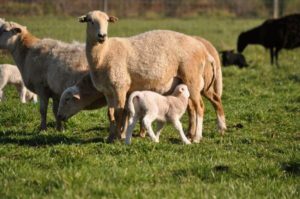 Take a stroll around the 800 acres that make up Double Brook Farm in Hopewell, NJ and you’ll see lambs sticking close to their mothers as they graze in green pastures. 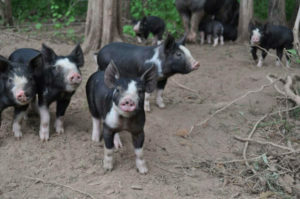 There are pigs with personalities all their own, chickens taking advantage of freedom to roam, and turkeys making a point to be the most social animals on the farm. The thousands of animals that call Double Brook Farm home live their lives in peace and contentment. Looking at the farm from the outside, you’d never know that they also live on one of only two officially certified on-premises slaughter facilities in the country. This compassionate farmer promotes an industry that values an animal’s life while appreciating its death. The pigs, sheep, chickens, turkeys, ducks, and cattle in Jon’s care are part of a closed loop of sustainability. They’re born on the farm, raised on the farm, and when the time comes, they’re humanely slaughtered in the farm’s stress-free environment. When asked why Double Brook Farm is only one of two, Jon spoke about the “industrial animal paradigm” that the world can’t seem to escape. People assume raising animals for the pure intention of one day killing them—and killing them in a way that leads to the most profit—is the only way to do it. Jon is proving them wrong. When the time comes for the animals at Double Brook Farm to be harvested, they walk with the humans they’ve come to know from their home pastures to the slaughterhouse. They don’t get on a trailer, they aren’t passed on to strangers, and they stay with the animals that are their friends and family. From the outside, the slaughterhouse looks like any other barn. Many of the animals living on the farm grow up seeing that barn every day. Being taken through its doors doesn’t alarm them, and they stay as calm and content as usual. Jon describes the next step in the process as the hardest part of his job. He picks up to 10 animals, usually the ones nearest the gate, for slaughter. In fact, Jon encourages everyone who buys groceries at a store to consider exactly how that packaged hamburger or chicken breast made it into their cart. A good portion of his farm’s profit comes from the slaughterhouse, but that doesn’t stop Jon from encouraging people to eat less meat or to at least know how the animal was raised. 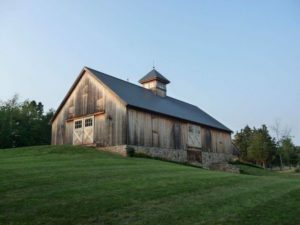 His main focus with founding Double Brook Farm and his related farm-to-table restaurant is to accomplish full sustainability. 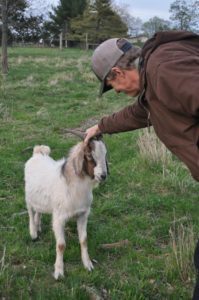 He wants to spread the idea of a “know your farmer” type of community based on pasture-raised farming methods. He wants to take animals out of confinement and give them lives worth more than their deaths.